A feature-heavy, well-made guitar perfect for performing artists. Great value for money. Eco friendly! 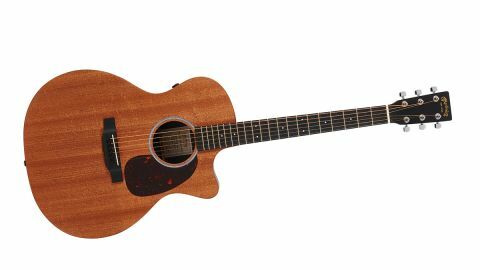 Westside spec'd GPCPA5S - aka 'Grand Performance Cutaway Performing Artist' - of course swaps spruce for sapele on top, and playability is identical to the other Westside Editions, too. The common 'Modified Low Oval'-profile neck and low action means that electric players worried about moving to a bigger acoustic neck need not fret. It's a much easier transition than you'd expect. The GPCPA5S shares the fret count of its recently-reviewed brothers but makes them easier to access with the addition of a cutaway. The only other difference is a Fishman F1 Analog pickup system, which adds an onboard tuner to go with the side- mounted volume and tone controls. Getting to grips with the guitar, it offers a touch more volume than the 00, and about the same as the dreadnought. Again, the tone and response of the solid sapele distracts from the budget materials used as the foundation of the guitar. The 645mm (25.4-inch) scale length provides enough tension to boost sustain, and make each note pop. The result is a balanced tone that fingerpickers will love. You can strum the thing, too, of course - the bottom strings ring out in a piano-like way, while the thin strings cut through without dominating the mix. Amplified, it's more of the same, albeit with the ability to tweak the output. Fishman knows its onions when it comes to acoustic pickups and its F1 Analog allows the guitar's tone to shine through. The onboard tuner is simple to operate, too.